The Christopher Salmon foundation and Wirral Libraries are once again pleased to announce that the Christopher Salmon poetry extravaganza will be returning for 2018 following the event’s huge success last year. The competition will be launched this month as part of Wirral Libraries’ poetry week. The annual poetry competition, now in its 8th year, began as a tribute to former Caldy Grammar School student Christopher Salmon who tragically lost his life to a rare streptococcal infection in February 2009, aged just 15. 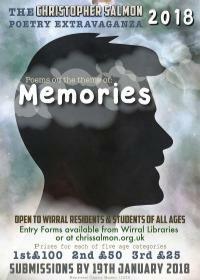 The theme for this year’s competition is ‘’memories’’ and is open to Wirral residents of all ages. Both winners and runners up in each age category will be awarded cash prizes and will be given the chance to attend a workshop with renowned local poet John Hughes. The prizes will be presented by Mr. Hughes at an awards evening for the winners and their families at Wallasey Town Hall. The overall winner for the aged 18 or under category will also become Wirral’s Young Poet Laureate for the following 12 months; with all winning poems being published in an anthology which will be available for purchase. Chris’s Parents Julie and Rich Salmon said “We are absolutely delighted that the competition has grown so much in popularity and now attracts entrants whose ages range from 4 – 94. It is wonderful to be able to do something positive and creative in Christopher’s memory which captures the imagination of so many talented people. The Christopher Salmon Foundation was set up in 2009 and has so far raised almost £50,000 for charity in Christopher’s memory. Full details of this year’s competition and official entry forms will be available from Wirral libraries and on the charity’s website, www.chrissalmon.org.uk. Completed forms should be returned to Diane Mitchell at Birkenhead Library by 19/01/2018.